I've Been There And Back. Well, my adventure of the Tetons began on the evening of the 19th of Sept. My truck was all packed and I had a few minor things to do. I decided to leave Ely somewhere between 10:00 p.m. and 12:00 a.m. and, barring any unforeseen circumstances, figured it would take somewhere around ten hours to get there. However, even the best laid plans can go awry. I departed home just before 11:00 p.m. and traversed most of northeastern Nevada, through just about all of northern Utah via I-80 and I-15, a smidgen of Idaho and a little of Wyoming on US Hwy 89. I took a wrong turn in Logan, UT but that turned out OK. It put me in Logan Canyon during daylight and I got a peek at the scenery there. I made a note to make Logan Canyon a destination sometime in the future rather than a waypoint like this time. There were a lot of oak trees which were turning in all their fall glory. Later, I drove past Bear Lake and noted that it, too, would make a great destination. Somewhere around twenty miles south of Jackson, WY I ran into some heavy duty road construction and, not that tear up one lane and make one-way traffic type construction either. They tore up the entire roadway right down to the bedrock, both lanes too. I was actually driving on rock! They had carved out the side of the mountain and ground it up to make new road bed. Take note of this because if you plan to visit the Tetons in the future and use this route, the construction is planned well into 2004. I lost an hour at the construction site and another hour when I first entered Utah because I went from PST to MST. Once out of the construction zone the sailing got smoother and I started to recognize names I had familiarized myself with on the map before I left home. My heart began to beat faster and faster as I got closer to my objective. I finally made Jackson, WY. Jackson is four to five times bigger than Ely and is also four to five times more congested. The highway narrowed but the lanes doubled to four... sometimes to five. Also, the pedestrian traffic went from nothing to hoards because it was Saturday and there was some sort of festival going on. I concentrated on staying on the correct route but still trying not to strike a perambulator and was successful in both instances. That was my only experience with Jackson during my stay, except when I had to pass back through. Once on the other side, the road widened and the traffic lessened. One thing I noted though, the gas was 20 cents cheaper here than at home. Just outside of town was the National Elk Refuge and I soon passed the National Museum of Wildlife Art and Refuge Visitor Center. There was a sign at the visitor center announcing they provided sleigh rides during the winter which would make for some great wildlife photo ops. I saw no wildlife on the refuge however. At this point my heart was really pounding because I knew I was close to the NP and soon passed through the "Gross Ventre" junction. The next sign I should see would be the NP entrance sign. WHAT THE HECK! I just got buzzed by a jet aircraft landing at the Jackson Hole Airport! It wasn't one of those twin jet 12 seater Lear jets either. It was more like a four engined, 40 passenger, DC-8 or whatever. Just when I was expecting the wilderness something like that happened. Needless to say, I was a little bit disappointed but, it's the new millennium and I should've expected this. Moose Junction was just ahead and I had to decide which route I was going to take. If I kept straight, on US Hwy 89, that'd take me to Moran Junction and if I made a left onto the Teton Park Road, that'd take me into the park proper. I decided to stay the course and proceed directly to Moran Junction. It was a good decision because the highway speed was 55 mph while the Teton Park Road was only 45 mph. As I got further north I passed familiar names... "Antelope Flats Rd", "Blacktail Ponds", "Schwabacher Landing", Triangle X Ranch", etc. When I got to Moran Jct., I turned into the NP. As I got nearer to the gate I noticed everybody was being waved through by the park ranger and, when I got up to the gatehouse, the ranger waved me through too. I stopped anyhow and explained I hadn't paid yet. She told me it was "National Public Lands Day" and entrance to the park was free. I told her I was going to be there for several days and didn't mind paying at this time but, she said I could pay the next day. She then noticed Sam, my dog, in the back seat and produced a milk bone biscuit and gave it to her and then waved me through. Sam gave her a quick thank you bark and I drove off. This event occurred each time I came back into the park. What nice people. 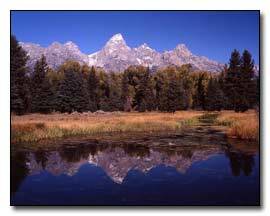 Soon I passed "Oxbow Bend" and came to the "Jackson Lake Junction". This junction is the northern terminus of the Teton Park Road. I kept straight and saw a sign "Flagg Ranch – 21 Miles". The Flagg Ranch was one of the changes to my plans. I decided to stay there rather than the original place because it was $10.00 per night cheaper. However, if I had to do it all over again, I would stay at the other place. I'll get into why in a little bit. "Pilgrim Creek", "Colter Bay Village", and "Lizard Creek" were the next familiar signs I saw and then the ranch sign came into view. Whew! Twelve hours later... and that's deducting the one hour loss of time zone change. I reported to the main Lodge immediately to check in. Nice place! The people at the Flagg Ranch are fantastic. The manager gave me a tour of the facility which included a restaurant, gift shop, and convenience store/gas station. The gas is 18 cents cheaper here than at home... and that's in a NP. However, the items in the convenience store had pretty steep prices on them. The first morning at the campsite my propane stove broke and I had noted they had one for sale in the convenience store so, later in the day I bought it. Gadzooks... $83.00! I needed it nonetheless so I coughed up the money. Just before leaving for the campsite I asked the clerk how much their cabins cost. $179.00 per night! The $22.00 I was spending on the campsite looked good at that point. They assigned me to a campsite away from everybody else because of Sam. I backed in and inspected it for a good place to set up my tent. Hmmm... I wonder what that big metal box is over by the picnic table? Must be for handiness to store food or something. Oh well. Sam was off smelling the unfamiliar smells of the area and seemed content but I wouldn't let her stray too far. I began the chore of setting up the tent and unpacking the necessities of living there for a few days. After about an hour of this I noticed long stringy brown hair on my tent which I must've picked up when the tent was being rolled out on the ground. Then I noticed the same type of hair all over the place... on the picnic table, on the ground, even up the trees. Uh-oh! When I got the map to the campground from the clerk she explained something to read which was on the back of the map. I dug the map out of the truck and there, circled in red felt tipped marker, were some dos and don'ts of the campground. Don't leave any food in the tent, don't leave any utensils which have had food on them in the tent, no cooking equipment in the tent, no bathroom items in the tent, no salves, creams, or other liquids in the tent, etc. etc. etc... .you get the idea. This was because of the bears. Not just any bears either... GRIZZLIES! Awww, what'd I get into now? I quickly figured out the purpose of the metal box, at the campsite which, is called a "Bear Box". I packed, my cooler with the spoilable food items, in the bear box and locked it. The rest of the "don't" items were packed back into the bed of my truck. Whatever happened to the "dos" on the list? Come to think of it, there weren't any. Each time I departed the campsite I made sure I didn't leave any "pick-a-nick" baskets out for Yogi or Booboo. When I finished setting up camp I figured I had about three hours of daylight left to explore so, I decided to investigate some of the park. Most of the roadways in the park are built on rock "ledge". During the winter the frost gets in-between the ledge and road "heaving" it upward... ergo, frost heaves which, there were plenty of. Also, bits and pieces of roadway had chipped off and been long discarded. The freezing water action of winter widened these chips until they became pot holes. All this, coupled with the chance of hitting wildlife, caused the powers to be to keep the speed limit down to 45 mph. You need to be aware of this when making your daily itinerary while at the park. It seems to take forever to get from one place to another. Eventually, I made it to the Jackson Lake Jct. and turned onto the Teton Park road. I passed other familiar names again like "Signal Mountain", "North Jenny Lake Jct. and Scenic Drive", "South Jenny Lake Jct. ", "Windy Point Turnout", etc. I even stopped once to take a picture which was near "Cottonwood Creek" where there's a little pasture with a small cabin and grove of trees in the background... oh... the mountains too. This is one of the few places where I broke out my D30 to take some pictures. That being done, I decided I better head back to camp and start dinner because I had been on the road for well over fourteen hours and was getting a little hungry. When I got back to camp I figured I had about an hour to eat, wash dishes, walk Sam, and get to bed. The stove worked as advertised that night so Sam and I had a meal of boiled rice with a beef stew mixture poured on top. I washed it down with some off brand cola I cleverly bought at home and then began the chore of washing dishes. Something you need to know about me... I'm a bachelor and I DON'T DO dishes! I've got a dishwasher at home that does that kind of thing or, I've got Sam to help. Ummm, want to come over for dinner sometime? It took me about 15 minutes to wash the four or five pots and pans I used for dinner and it was dark by the time I got back to the tent. After I put everything away it was time to give Sam a short walk so she could do her business. I put her in the truck before I went to do dishes so I had to get her out when it was time. Something was up though... she didn't want to get out of the truck. I had to reach in and pull her out. After she was unceremoniously pulled from the truck, she wouldn't leave my side. We walked down the road a short distance and she "finally" got down to work. When finished, she pert near ran back to the truck. I had to force her into the tent to sleep which, she obviously didn't want to do. Something was amiss but I was never sure of what it was until the last night there. Anyhow, I fell asleep right away and woke up at 3:00 a.m. the next morning. Sheesh, I don't remember bringing an air-conditioner along with me. It was freezing out! Actually, it was 24 degrees. I got down to the business of getting ready for that day's adventure and the moving around would help warm me up. I got Sam back into the truck and started on the coffee. That's when I discovered my stove broke. Drat, what a way to start the day. So, I took a shower and packed all the little "pick-a-nick" baskets away. I hopped in the truck and headed out. It was just about 4:30 a.m. and it was still dark. The sun wasn't even hinting at coming up. I decided the first place to go would be the same place I stopped at the afternoon before, the little pasture near Cottonwood Creek. I knew it would be a good shot but forgot about the time of year. As it turns out, fall is a bad time of year for that shot. It's a good afternoon to late afternoon shot but, not a sunrise shot. By the time I realized this, it was too late for any sunrise shots anywhere else. I headed back north to get to Oxbow Bend for early morning shots but on the way there, I stopped a park ranger to get some directions. I asked her how familiar she was with the park and that I was going to test her knowledge. She replied she knew it like the back of her hand. I asked her if she knew where "The Old Patriarch" tree was and was expecting detailed directions but, she just gave me a dumb look. She was wearing gloves so; I couldn't see the backs of her hands. After explaining to her the story behind the tree she admitted she simply didn't know anything about it. Well, off to Oxbow Bend. But... COFFEE FIRST! It was late enough for the convenience type stores at the Lodges to be open so I decided to stop by and get a cup. They certainly don't know how to make coffee at any of these stores... not unless you like half the grounds being in included. And, at $1.69 per 20 oz. cup you'd figure they'd do a better job! I wonder how they come up with those prices? So, with coffee in hand, actually in the cup holder, Sam seemingly more content than at the camp site, I was off to the races. I spent the rest of the day shooting at given locations and returning during the very late afternoon hours for dinner and sleep time. That is a description of my typical daily activities with the exception of the broken stove. That first full day I decided to part with my hard earned $83.00 and buy the stove. I needed it anyhow. That night, and the rest of the nights, I let Sam sleep in the truck and let her out first thing in the mornings so she could do her thing which, she did immediately, and let her happily back in the truck. On the first full day I decided to explore and find "The Old Patriarch" tree. I parked on a dirt turnout a couple of hundred yards south of the "North Jenny Lake Jct." and headed directly east. I had my compass with me to keep me on bearing. I didn't have my cameras with me because it was the wrong time of day so the going was pretty easy. I hiked for approximately 1 to 1½ miles, passing through several groves of trees, and spotted the tree. I checked out possible locations for potential compositions and decided on what I thought would work best. Using a reverse azimuth, I headed back to the truck and came out exactly where I first entered. From that day until the last I looked for the park ranger, who didn't know about tree, but never spotted her. The next morning I was up bright and early, well... not bright, and on my way to get some sunrise shots of "The Old Patriarch". I had a thermos of coffee with me this time though. Best tasting coffee I've ever had too! I got to the dirt turnout and started donning my S&F vest and backpack. Something I didn't take into consideration though is that I dressed in layers. Again, it was cold and I had on two shirts, a polartec type pullover, and a polartec type vest. I had rigged the camera vest and backpack for when I wasn't wearing this much clothing so I had to quickly readjust them to fit. It took ten minutes at most and I was soon off. I was wearing a wide brimmed hat with a small "Petzel" LED type lamp attached. The brim of the hat kept the light reflection out of my eyes but allowed the light to hit the ground about three feet in front of me. Nice little combination. One of the tripods was slung under my backpack and I carried the other one over my shoulder like you'd carry a rifle. I had my compass in my other hand and made good time. During the hike I could hear bull Elk bugling all around me. There must've been 15 to 20 bulls calling in their harems but it was too dark for me to see them. When I got to the tree I set up my tripods and cameras and made several adjustments to their locations for that "perfect" composition. When I was happy with their placement it was light enough out see clearly. The Elk had disappeared by this time and were probably holed up in the woods for the rest of the day. When the sun "kissed" the tops of the mountains I knew I had to act fast. During that time of year the sun rises fast and I had maybe 15 minutes from the time it first hit the mountains until I was enveloped in its light. My GND filters were useless for this shot because of the composition but, I had my warming polarizers on the lenses and I looked into the viewfinders several times to make sure they were rotated just right. I started shooting just when the tree was starting to get bathed in light and ran through two rolls of 35mm and one 120mm roll. By then, the show was over and I packed up and headed back to the truck. I was elated with that shoot. I was the only one there and I got in a shot that few people care to try to get. If you visit the park and want a shot of the tree, just follow the described directions and you'll get it. I've modified my LowePro S&F vest with a couple of 1 inch quick release type buckles sewn to the shoulder harness and put the mating buckles on the shortened camera straps so I could quickly "clip" the cameras to the vest. It's a secure way of carrying the camera but still keep my hands free. The straps are long enough to quickly lift the camera to my eye without unhooking it from the harness too. Pretty neat little modification if I say so myself. I had the 70-200mm lens on the 35mm camera for the chance I might come across an Elk. I was careful not to hit the front of the lens on any limbs because I didn't have the lens cap on. However, I didn't see any wildlife on the trek back to the truck and once back at the truck I quickly packed and headed out to the next morning shots. So on and so forth. The following morning I experienced my one and only problem with another photographer. I decided I was going to shoot the "Mormon's Row" at sunrise. 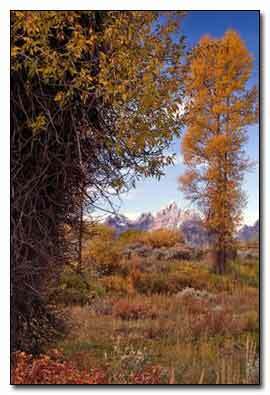 Grand Teton NP has a lot of private property on it and you have to be careful of where you go and what you do at times. The "Mormon's Row" area is very much like that but, the barn I wanted to shoot was on NP property so, there shouldn't have been a problem. I scouted out the area the day before and decided on how I was going to conduct the shoot. "Mormon's Row" is on the Antelope Flats road which, is paved and I found a little dirt turnout, near where I wanted to shoot from, and stopped. I got out my camera and composed for the next day. What I wanted to do is compress the barn and the mountains in the background so they seemed much closer than what they actually were. 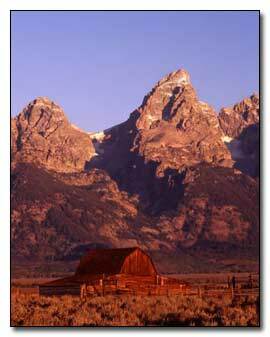 This would give the mountains a more grandeur appearance and the barn a more humbling look. To do this you have to use a telephoto lens of 135mm or greater. I decided to use the 70-200mm on the 35mm camera and the 210mm lens on the MF camera. Yep... it looked good. I snapped a few daylight handheld shots and headed out for the rest of the days shoot. The next day I was up at 3:00 a.m., got the coffee started, and took a shower. I got the campsite "Yogi & Booboo" proofed, let Sam out of the truck for her morning rituals, got her packed back in and was gone by 4:45 a.m. I arrived on location again before the sun had a clue on coming up and got set up. It was so dark I could see the stars. The Milky-Way was in full view! Shortly after getting set up a couple of other photographers stopped by to see what I was doing so far away from the barn. I explained to them what I was doing and how I was going to accomplish it. They both agreed that it'd be a good shot and decided to set up there too. We had several intelligent conversations about photography while we waited for the sun to come up. We talked about f/stops, focal lengths, filters, cable/remote releases, tripods, and so on and so on. It was great. We had another thing in common too... freezing! Again, it was 24 degrees and I worried a little about my batteries so, I kept checking them during the conversations we had. So far so good. After the sun lightened the sky but, before striking the mountains, several more photographers had shown up. They parked in the parking area nearer to the barn though. But... one of the late comers walked out in front of the barn and started setting up his equipment. He knew we were there because he looked directly at us. Still, he kept to his shot. After a short discussion with my fellow photographers, I approached the late comer and indicated to him where we were set up and what we were doing. He said he could move a couple of feet but I explained to him that he'd have to move 25 yds or more to get out of our shots. He turned away and ignored me from that point. There really wasn't much I could do because we were both on public property and I walked back to my fellows and gave the details of the conversation with this "other" guy. One of the new colleagues I had would have nothing to do with this. He marched over, with intent, to the late comer and politely explained to him to "Get *#%@ out of the way!" It worked! We got our shots and soon departed. Who was right? My opinion, I was. I'm sure the other guy would differ with me on this but, I believe in the unwritten rule of "First come... first served" and not to interfere with the photographer who got there first... or at least set up first. I got to the parking lot, saw I was the only one there, and decided to thaw out for awhile. I parked near the west end of the parking lot so I could work out the back of the truck. Shortly thereafter another guy showed up who squeezed in-between me and the edge of the drop off to the river. I couldn't even open up the back door of the truck and wondered how he was going to get out of his van. I moved slightly to make things more convenient. Then another guy showed up who got out of his truck immediately and got ready to move out. I noted he was wearing a LowePro S&F vest/belt system just like me. Hmmm, smart fellow he is. He had three camera pouches and four lens pouches attached to the vest and a camera with lens on the tripod. And you thought I over killed! He headed out right away and walked down the path to the river and downstream a little. It looked to me like somebody else did a little scouting the day before too. Without over exaggerating I'll bet more than a hundred photographers showed up for that shoot. Most were strung out along the roadway but somewhere around 25 or so were where I was shooting from. Needless to say, it got a little crowded and I thought "So much for using my truck as a work bench." It made for some good conversation though. Everybody knew about DOF, auto-focus, GND filters, and the such. One guy, who set up next to me, asked me how I was going to meter for the shoot and I told him I was spot metering and using my 18% "green" card. This caused quite a stir because everybody within earshot had never heard about, much less seen, an 18% green card so, I proudly produced the card and flashed it around like some sort of badge. The same guy who asked about the metering asked if he could use it so I let him use my spare grey card, instead. But, when he asked to use my GND filter... uh-uh. You're out of luck pal. I also explained to everyone about the guy who set up earlier down by the rivers edge so they could compose their shots without him being in them. At first there were a few cries but when I related to the "First come, first served" rule, everyone quieted down. There were no other incidents. When the sun started coming up everybody got down to business and started getting their once in a lifetime shot in. After the shoot everybody was happy and we all slapped each other on the back for a job well done! Come to think of it, I was the only one there who had two tripods and cameras set up. I had my floppy hat on and was wearing my S&F vest/belt. At least I was fashionable. Before we left, I let Sam out to take in some Oxbow Bend smells. After all... this was her vacation too. Sam and I were the first to get there and the last to leave. Soon after, the place was deserted. My last sunrise shot was at the "Windy Point" turn out. When I scouted out the shot I decided there wasn't much there unless you zoomed in on the mountains... catching the earliest of the suns rays. Clouds encompassing the mountain tops would be good. Again, I was on location about 5:30 a.m. and stayed in the truck to thaw out. I kept the heater running to aid in the defrosting and... yep, you guessed it... I fell asleep! I woke up early enough though and had about 15 minutes to spare. I quickly got out of the truck and set up both the 35mm and MF cameras and put the 70-200mm on the Canon and the 210mm on the Mamiya. I metered but knew that would change once the sun crested the horizon and started to light the mountains. I had time to kill so I looked around and saw two other people and one car parked there. Two ladies were trying to watch Elk but they were too far away. They had a small P&S digital camera but didn't know too much about it. I thought, "How the heck can they get through life without knowing anything about photography?" I left them to themselves and went back to my set-up. The sun came up and I fired through 1½ rolls of both 35mm and 120mm film. I used my GND filter for both cameras and also had warming polarizers on each lens. This slowed the shutter speed down quite a bit. Because the sun rises fast at this time of day and year, I handheld the GND. It has a "soft" transition area and hand holding would blur the transition even more. I just had to be careful not to bang the filter against the end of the lens barrel which could possibly scratch the filter or cause camera shake... especially with the long glass attached and slow shutter speeds. All worked out well. I'll call the guy Bud... I don't want to embarrass him anymore than what he already did. Anyhow, Bud was driving their van along one of the roadways. His wife was in the passenger seat. About a quarter of a mile in front of them Bud saw a guy pull over and get out of the car. The guy had his equipment in hand and quickly sprinted across a small clearing and into a thicket. Bud thought, "Wow, this must be a good shoot because that guy got out!" Bud pulled over and grabbed his camera and a couple of lenses. About half way across the clearing he noticed the guy crouched down and peering through the underbrush. Bud put the viewfinder to his eye and pointed the lens in the direction the guy was looking but couldn't see anything of importance though. He yelled out "What?" The guy looked at Bud and waved a roll of toilet paper at him and went back his duties. So, even the guy with the most expensive equipment and experience can get caught up in the frenzy of getting in the shot everybody else is. The Oxbow Bend evening shot turned out pretty good. I was using a 28-70mm lens to get in those wide angle shots. Just before the sun went down a Bull Moose ventured out to the shoreline and started to graze along the shore for a few minutes. He then plunged into the water and swam to the other side of the river. Those who had telephotos on got in some good shots. I snapped off a few shots but they didn't turn out very good. Who wants to see a black dot in the water? After the sun went down everybody left the area. I turned to the east and noted the pink to purplish colored sky and it's reflection in the water so I mounted the 70-200mm on the camera and took some shots of the far shoreline. The shutter speed was around two seconds. Those shots turned out pretty good too. Another good location was the "Blacktail Ponds" where I got wet. The parking area is on a bluff overlooking the Snake river and just to the north at the foot of the bluff are some ponds with a small inlet from the river. I gingerly walked down a gully to the foot of the bluff and headed out to the ponds... about a quarter of mile away. This is a nice mid-morning shot and anything earlier wouldn't be productive because the sun would be too low and the bluffs shadow would obscure the ponds. Anything later and the reflection of the mountains wouldn't appear. So, mid-morning it is. As I was hiking I started to sink in the muck and soon got ankle deep before I decided to turn back. Whew, what a smell! I'll bet some of that stuff I churned up hadn't seen the light of day or been exposed to the air in centuries. I backtracked to where I thought it'd be safe to get closer to the foot of the bluff. Once on dry land, I had to be careful of the loose gravelly soil but soon made it to my destination. I set up and fired off seven or eight shots per camera. While I was packing to leave I noticed a pathway over by another gully not too far from where I was set up. I took this path which guided me back to the parking lot. Sheesh! If you decide you want a "Blacktail Ponds" shot follow these directions: Just to the north of the parking lot is a gully and just across the gully is a small fisherman's path. Take that path to the next gully, about ¼ of a mile. Traverse slowly down the gully and go to the river's edge. There you have it. When I got back to the truck my shoes had dried out and the smell had dissipated to the point where Sam didn't even notice the odor. An additional mid-morning shot is at the Snake River overlook. If you get there too early, the shadow of the bluff will impose itself on the river and the immediate surrounding of trees. Spring would provide better shadows of the bluffs across the river but Fall has the colors. A partly cloudy day would've been nice. The parking lot is at the top of more bluffs and overlooking the Snake river which has gouged its way deep into the terrain. About five miles across the flats of the opposing bluffs are the mountains. There is a rock and mortar wall between you and the very steep bank. I'll bet the viewing area is about 500 to 700 feet higher than the river. I set up towards the northern end of the viewing area... right up against the wall. There were several other photographers set up too. One guy had a 4x5 large format set up and took two shots during the 45 minute stay I was there. The other guy had a "Super 8" camera on a tripod that was set for time lapse with one shot every five seconds. He started at sunrise and was still shooting when I got there. Pretty neat! When they left, another photographer showed up with an 8x10 large format. Every now and then I fire off a couple of shots. He remarked he couldn't do that with his behemoth, with the cost of film and all. So, there are pluses and minuses to each format then. I hadn't thought about this before. Well, that pretty well much covers the shooting I did while at the Tetons. One other place worth mentioning is near "Spread Creek" which is located just to the south of Moran Jct. There was road construction going on and I was trapped for about 15 minutes. I looked to my left and saw what I thought was a nice view and quickly grabbed my digital camera and hopped out to snap off a few shots. I noticed a couple of other photographers had gotten out of their cars too. "It must be a good shot because that guy is shooting too." Heh heh. I made two forays to the Moose Post Office to mail off some film. For the entire trip I shot 16 rolls of Kodak E100GX, seven rolls of Fuji Provia 100F, one roll of Kodak E100SW, and one roll of Fuji Velvia ISO 50. If my abacus is correct, that's a total of 25 rolls of film. All but six were mailed from the Moose Post Office and I mailed the other six the following day I got home. I only broke out my digital three times for a total of 56 shots. Those were immediately copied to a CD when I got home. I stopped in the main Visitor Center, located in Moose, just one time which, is a typical NP visitor center geared to its park. I overheard a lady explain to one of the rangers that she'd been camping about 30 miles south of where I was camping and that the evening before a Black Bear ventured into the campsite and chased everybody out. She reported the bear had an ear tag and the ranger replied that they were familiar with the bear. He also said they'd have to trap the bear again and put him further out in the "back country". I asked him about the bear population up where I was camping. He said he hoped I wasn't "tent" camping because that was heavy duty grizzly bear country. Oh great... that's all I needed to hear! I had one more night to spend. While visiting with, talking to, and observing other photographers, I noticed a lot had one of those spirit levels attached to their camera hot shoes. The purpose of the level is to keep the camera level... no matter if you're shooting horizontal or vertical. I have this problem of getting the camera perfectly level so I asked about them. Everybody agreed the price was somewhere around $25.00 and I could pick one up at my local camera store. Yeah, right! Evidentially they didn't live in the middle of nowhere like I did. I'd have to check the B&H web site when I got home and see if they have this. When I got back to the campsite my final night I noticed several people had moved into the site next to mine. I went to bed they were still setting up and making a lot of noise. This didn't bother me because the day's activities wore me out. I fell asleep while they were still busy getting their tents set up. Maybe they put food in their tent and if a grizzly showed up he'd go for them instead of me. The next morning I got up at the same time and went through the typical morning rituals of getting ready for that days shoot. When I closed the roll-top cover of my truck bed I accidentally got the little remote control for the locks caught in-between the roll-top cover and tailgate. The panic alarm went off! Uh-oh. I shut it off and in a normal voice apologized. I know it woke them up but they didn't say anything. Heh heh... payback, accidentally. My last day there I didn't get packed until early afternoon. I departed the campsite somewhere around 3:00 p.m. and decided to drive the Teton Park Road through the park. It sure seemed faster going through the park this time around. I made it to the southern end of the park and was on my way. Again I passed through Jackson without incident. It sure looked like they were having another festival because the streets were packed with people. I found a good radio station and wanted to get caught up on the news. Thirty minutes later I found the road construction which had gotten worse because they had more of the road tore up. Hours later I was back in Logan Canyon but this time it was night and I almost hit a couple of cows in the open range portion of the canyon. I stopped in Logan at a Wendy's because I hadn't eaten since the day before. I got Sam something too. I hate feeding her that kind of food but I had no choice. A couple of more hours later I was back on I-80 headed west onto the "salt flats". I had to stop at a rest area because I couldn't keep my eyes open any longer. Boy... was I tired and I caught four hours of sleep! Two hours later I was pushing the remote for my garage door opener. I've since gotten all of my film back from A&I labs in Hollywood, CA. They do a great job. They combined all of my film into one box and FedEx'd it back to me. I've replenished my film supply and mailers by going on the web to B&H. I even ordered and received one of those spirit levels I mentioned but only paid $24.95... not the $25.00 like everybody else did. I've cataloged, labeled, and stored all of the 35mm slides in their protective sleeves but I'm going to have to order sleeves for my MF shots. I got them back uncut and will have to figure out how to label them. Also, I've posted a few of the shots on Outdoor Eyes and have received favorable comments and critiques on them. Thank you everybody who made comments and/or critiques. 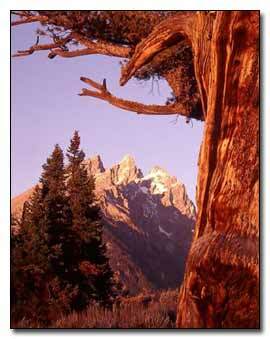 The visit to Grand Teton National Park was a fantastic adventure. I couldn't have asked for a better companion than Sam. She was so good while there. I met quite a few fellow photographers and learned from some of their experiences. I hope I was able to share a little of my knowledge with them, too. I had been looking to visit the Tetons for quite some time and can now say I've been there and back. 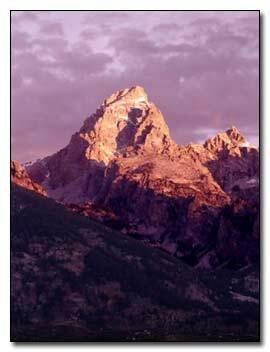 Click Here To View The Grand Teton National Park Map.